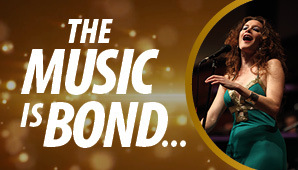 The venue and promoter have now confirmed the rescheduled date for The Music is Bond at Christchurch Town Hall. The performance will now be held on Wed 8 May 2019 at 8:00pm. Your ticket(s) are valid for the rescheduled date and do not need to be exchanged. Simply present your existing ticket(s) at the Christchurch Town Hall on the new date. Proudly supported by Aston Martin, Craigs Investment Partners and The George Christchurch.